The Bryan brothers' teamwork conquered a win yet again as they defeated the doubles team Treat Huey and Steve Johnson 7-6(5), 7-6(4). The top-seeded tennis duo scraped by an admittedly tough match as Huey and Johnson matched the Californians best effort. The key stat for the Bryans victory was a commanding lead in second service points won: 59 to 40 percent. The Bryans also showed more consistency in return points won with a notable seven percent lead. Down 5-1 in the first set, Treat Huey and Steve Johnson team fought back in a shocking comeback and extended the set to 6-6. Also, while the Bryan brothers had a double set point at 6-4, Huey and Johnson managed to gain one more point before narrowly losing the first set tiebreak 7-6(5). However, despite the team's attempts, the Bryan brothers played strong and stole the first set. Each team had two service breaks. Similarly to the first set, the second set also came down to yet another tiebreak. The second set games leading to the second tiebreak involved strong service games from both teams, but ultimately the even plays resulted in a 6-6 tie. Under the pressure of one last set, the Bryan Brothers managed to win 7-6(4) in the final set. 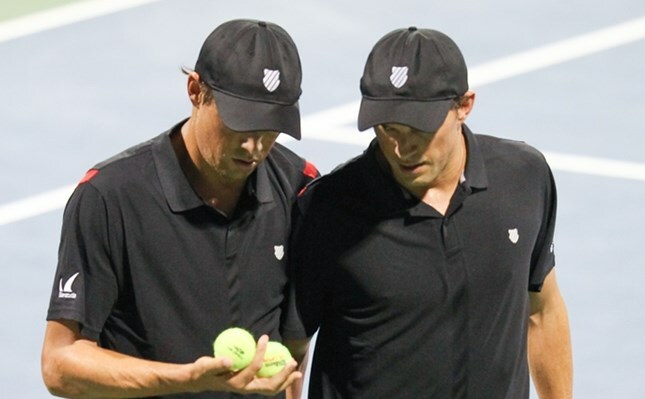 The Bryan Brothers will now advance to their quarterfinal match at the BB&T Atlanta Open. They will either play the winner of the Christopher Eubanks/ Donald Young and Austin Krajicek/Nicholas Monroe match.